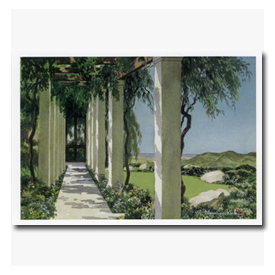 Own a little piece of Larry and Maj's Heaven with these unique items conceived by Maj. Limited quantities left of all. 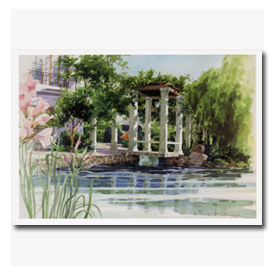 Conceived by Maj, these four (4) different notecards feature a beautiful watercolor scene of Heaven by Norman Kirk painted especially for Larry and Maj.
Each notecard sells for .99 cents each, or the set of four (4) for $3.50. 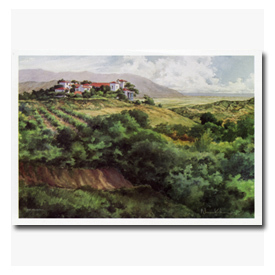 Order your Heaven notecards using the below PayPal button. 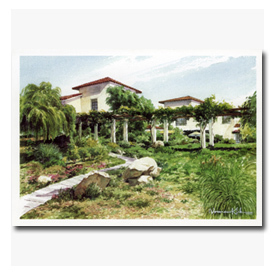 Set of Four (4) Heaven Notecards. 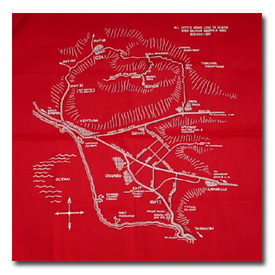 This red cotton scarf, measuring approximately 21 inches square features a map and layout of Larry and Maj's Ojai ranch named Heaven. Each cotton red scarf sells for $9.95. Order your red cotton Heaven scarf using the below PayPal button. 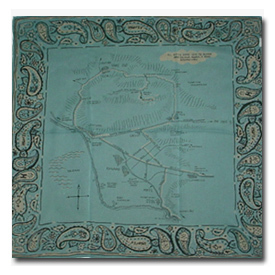 This teal silk scarf, measuring approximately 24 inches square features a map and layout of Larry and Maj's Ojai ranch named Heaven. An absolutely beautiful design by well-known lingerie designer Mary Green, who was a friend of Maj's. Each teal silk scarf sells for $19.95. Order your teal silk Heaven scarf using the below PayPal button.